Saute onion & garlic in small amount of oil, and let us cool. Add mince and spices to taste. Combine and form small meatballs, the size of walnuts. 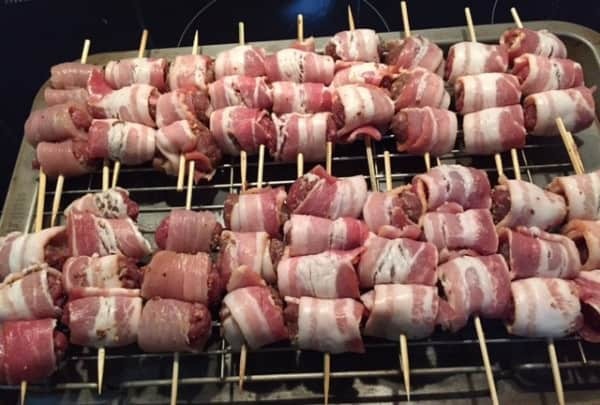 Cut each length of bacon in two, spread with mustard and fold a strip around each meatball. Place 3-5 meatballs on a skewer, depending on length thereof. Grill or BBQ over medium fire or prepare in griddle pan or bake in oven at ±180°C. Serve with sweet chilly sauce or any other sauce of your choice. This looks so delicious, as a BACON addict.